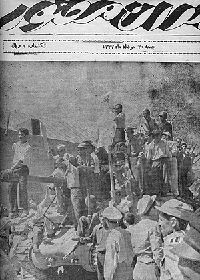 Front cover of Tehran Mosavar, a Tehran weekly, showing the events of the coup d'etat in August 19, 1953. The 1953 Iranian coup d'état deposed the government of Prime Minister Mohammed Mosaddeq and his cabinet, it was effected by Gen. Fazlollah Zahedi, Secret Intelligence Service (SIS), and CIA agents working with anti-Communist civilians and army officers. The attempt to encourage a coup d'état, Operation Ajax, required CIA man Kermit Roosevelt, Jr.'s bribing government officials, the news media, and businessmen, to allow imposing retired Gen. Fazlollah Zahedi and Imperial Guard Col. Nematollah Nassiri as the government. This deposition of a formerly elected civil government saw the return to power of the pro-Western Shah, Mohammad Reza Pahlavi, whose dictatorial rule continued until the Iranian Revolution of 1979. The coup was a Cold War incident; it was feared that Mosaddeq's government would shift Iran into the Soviet Union's sphere of influence. The coup was precipitated when Mosaddeq nationalized Iran's oil industry, which had been owned and run by the British since 1908, with hardly any revenue benefiting Iran. In the United States, Operation Ajax (originally viewed as a triumph of covert action), is now regarded as a mistake that has compromised U.S.'s ability to defend democracy around the world. Reasons given for why the coup occurred include significant domestic dissatisfaction with the Mossadegh government (especially within the Iranian military) and a CIA propaganda campaign. Motivations given for the foreign coup planners include desire to control Iranian oil fields and more benign concerns over Iran's coming under the control of the Soviet bloc of Iran's traditional enemy, Russia. The Pahlavi dynasty had risen to power promising to reduce foreign influence in Iran. In the first half of the twentieth century, Iran had been more or less run from the British and Russian embassies. Ironically, the leaders of the 1979 revolution condemned the Shah as a puppet of the decadent West. With other examples of Britain and the U.S. supporting non-democratic, oppressive regimes, the legacy of the Mosaddeq coup makes the task of spreading freedom around the world harder to achieve, since the real intent of intervention by the Western powers, when this occurs, is dismissed as self-interest, with no genuine concern for the people of the country concerned. The principal cause (among others) of Operation Ajax (the coup d'état) was Western (American and European) dispute over the nationalization of the Anglo-Iranian Oil Company between the Imperial British government and the civil Iranian government. In May 1901, Mozzafar al-Din Shah Qajar, the Shah of Persia, sought to pay debts owed to Britain by granting a 60-year petroleum search concession to William Knox D'Arcy. These debts were in the main due to the Shah's extravagant life-style. The exploration took seven years, and was almost canceled, but yielded an enormous oil field—from which Persia would receive only 16 per cent of the future profits. The company slowly grew, until World War I, when Persia's strategic importance led the British Government to buy a controlling share in the company, essentially nationalizing British oil production in Iran for a short time, becoming the Royal Navy's chief fuel source in defeating the Central Powers; British soldiers occupied Persia's strategic parts. Not only did Britain control the oil, but it treated Iran as if it were a colony; the country was governed from the British and Russian embassies, so that even nominations for membership of the Majlis (Assembly} were controlled by the ambassadors, who each handed a list to the Prime Minister. The Persians were dissatisfied with the British oil concession and the royalty terms, whereby Persia only received 16 per cent of net profits, and with the degree of influence exercised by Britain over Iran's government. The dissatisfaction was exacerbated when the British tried to use Iran to attack Russia to overturn the Bolshevik Revolution's deposition of Tsar Nicholas II. In 1921, a British military coup d'état enthroned Reza Pahlavi as Shah of Persia, who then undertook modernization advantageous to the British and the Persians such as the Persian Corridor railroads for military and civil transport. In the 1930s, Nazi Germany courted the Shah for secure access to oil for their war effort. The Shah turned to Germany to counter British influence but he was also influenced by Nazi "phrases and methods which suited his dictatorial and nationalistic aspirations." For his part, Adolf Hitler declared that Iran was a "a pure Aryan country." On the "eve of World War II, Iran housed German agents and the government had economic and political commitments tying it to a pro-German policy." The Shah ended the APOC's concession and resettled it within a year: A reduced drilling area and increased Persian government profit from its natural resources. On March 21, 1935, Reza Shah Pahlavi, decreed that foreign delegates use the country term "Iran" instead of "Persia" in formal correspondence; the Anglo-Persian Oil Company (APOC) became the Anglo-Iranian Oil Company (AIOC). In 1941, after the Nazi invasion of Russia, British and Commonwealth forces and the Soviet Union invaded Iran, securing the Persian Corridor supply lines for the Soviet-Nazi fight in the Eastern Front, and Iranian oil fields for the Allies. Moreover, they deposed the supposedly "pro-Nazi" Reza Shah and enthroned his twenty-two-year-old son, the Crown Prince Mohammad Reza Pahlavi. In Iran, a constitutional monarchy since 1906, nationalist leaders became powerful in seeking reduction of long-term foreign intervention in their country—especially the greatly-profitable British oil concession. In particular, the AIOC's refusal to allow auditing of accounts to determine whether or not the Iranian government was being paid its due royalties in full. The AIOC's refusal escalated nationalist demands to: An equal share of petroleum revenue. Finally, the crisis was the AIOC's closing rather than accepting Iranian government "interference" in its business. The AIOC and the Iranian government resisted nationalist pressure for a renewed deal in 1949. In 1951, the AIOC's resistance to re-negotiating their petroleum concession—and increasing the royalty paid to Iran—created popular support for nationalizing the company; the nationalization impulse was not only strong, but passionate. In March, the pro-Western P.M. Ali Razmara was assassinated; the next month, the parliament legislated the petroleum industry's nationalization by creating the National Iranian Oil Company (NIOC). This legislation was guided by the Western-educated Dr. Mohammed Mosaddeq, then a member of the Iranian parliament and leader of the nationalization movement; by May, the Shah had appointed Mosaddeq Prime Minister. Commenting that Mosaddeq had opposed his father's appointment as Shah, Mohammad Reza Pahlavi explained that though wary of Mosaddeq's brand of nationalism and of his "violent anti-British sentiment" he believed that his experience was needed at this time of crises. He also hoped that he would be cautious in asserting Iran's rights, since the "path to political and economic independence was full of pitfalls." That summer, American diplomat W. Averell Harriman went to Iran to negotiate an Anglo-Iranian compromise, asking the Shah's help; his reply was that "in the face of public opinion, there was no way he could say a word against nationalization." Harriman held a press conference in Tehran, calling for reason and enthusiasm in confronting the "nationalization crisis." As soon as he spoke, a journalist rose and shouted: "We and the Iranian people all support Premier Mossadegh and oil nationalization!" Everyone present began cheering and then marched out of the room; the abandoned Harriman shook his head in dismay. The National Iranian Oil Company suffered decreased production, because of Iranian inexperience and the AIOC's orders that British technicians not work with them, thus provoking the Abadan Crisis (the expulsion between 1951 and 1954 of Western oil company personnel from Iran) that was aggravated by the Royal Navy's blockading its export markets to force Iran to not nationalize its petroleum. The Iranian revenues were greater, because the profits went to Iran's national treasury rather than to private, foreign oil companies. By September 1951, the British had virtually ceased Abadan oil field production, forbidden British export to Iran of key British commodities (including sugar and steel), and had frozen Iran's hard currency accounts in British banks. The United Kingdom took its anti-nationalization case against Iran to the International Court of Justice at The Hague; P.M. Mossadegh said the world would learn of a "cruel and imperialistic country" stealing from a "needy and naked people." Representing the AIOC, the U.K. lost its case, yet, worried about its other Iranian interests, believing the misconception that Iran's nationalism was Soviet-backed. In the event, they persuaded Secretary of State John Foster Dulles that Iran was falling to the Soviets—effectively exploiting the narrow, American Cold War mindset—yet President Harry S. Truman never agreed to their overthrowing of Prime Minister Mohammed Mosaddeq; but, later, in 1953, when Dwight D. Eisenhower became president, they convinced him to a joint coup d'état deposing Iran's only democratically-elected government in order to re-establish foreign (British) control of Iran's petroleum. Overthrowing Mosaddegh's government was a British idea for which they asked President Truman's aid; he refused. Later, in 1953, when Eisenhower became president, the British asked him and he agreed to their jointly deposing the elected Iranian civil government. Prime Minister Mosaddegh, having decided that Iran must profit from its own petroleum, acted to nationalize that natural resource previously controlled by the Anglo-Iranian Oil Company. Britain complained the Iranian government was violating the AIOC's legal rights and headed a world-wide boycott of Iranian petroleum, provoking a financial crisis for Iran's economy. The monarchy, supported by the U.S. and the U.K. invited Western oil companies back to exploit Iran's petroleum. "The crushing of Iran's first democratic government ushered in more than two decades of dictatorship under the Shah, who relied heavily on U.S. aid and arms," wrote Dan De Luce in The Guardian in reviewing All the Shah's Men, by New York Times reporter Stephen Kinzer, who, for the first time, reveals the details of the coup d'état. Contemporary controversy about the Operation Ajax coup d'état is whether or not the Americans and the British had legitimate fears of Communist influence in Iran that might have limited their access to its petroleum. After World War II, the U.S.S.R.'s Allied-agreed domain included Central Asia and much of Eastern Europe. As the Iranians nationalized their country's petroleum, on June 26, 1950, North Korea, with Soviet approval, crossed the 38th parallel and invaded South Korea in a reunification war known in the West as the Korean War. Three years later (just before the Anglo-American coup d'état against P.M. Mossadegh), the Soviets crushed an uprising of strikes and protests in East Germany. [the year] 1952 was a very dangerous time. The Cold War was hot in Korea. The Soviet Union had tried to take all Berlin in 1948. Stalin was still alive. On no account could the Western powers risk a Soviet takeover of Iran, which would almost certainly have led to World War III. Mohammad Reza Pahlavi says that the Soviets supported Mossadeq, planning to use him to overthrow the monarchy, then to eliminate him "two weeks after my departure." According to the Shah, Mossadeq wanted nothing more than to oust the "Pahlavi dynasty." Others argue that the “communist danger” did not pose a real threat, that the Tudeh party lacked sufficient support to take over the government. The Tudeh did not initially support Mossadeq, either. Halliday says that they only openly supported Mossadeq, who was "anti-communist" during the last year of his government. Halliday points out that the anti-Mossadeq coup could only have been successful, too, because of the weakness of his own position and the opposition of "the dominant class:" "Had Mossadeq had a following that was organized, and based on the oppressed in town and country, the resistance to the coup would have been much more substantial than it was." In fact, says Halliday, Mossadeq "had no political organization worthy of the name." As part of the post–coup d'état political repression of the Tudeh, the imposed imperial government revealed that the party had 477 members in the Iranian armed forces: "22 colonels, 69 majors, 100 captains, 193 lieutenants, 19 noncommissioned officers, and 63 military cadets," however, none was member of the tank divisions, stationed around Tehran, that might have participated in the Shah's anti-democratic coup d'état; he had carefully screened them. Under the Shah, a pro-American government gave the U.S. a double, geographic and strategic advantage, as Turkey, also bordering the U.S.S.R., was part of NATO. As a condition for restoring the Anglo-Iranian Oil Company, the U.S. required collapsing the AIOC's monopoly; five American petroleum companies, Royal Dutch Shell, and the Compagnie Française des Pétroles, were to draw Iran's petroleum after the successful coup d'état—Operation Ajax. Operation Ajax's formal leader was senior CIA officer Kermit Roosevelt, Jr., while career agent Donald Wilber was the operational leader, planner, and executor of the deposition of P.M. Mossadegh. The coup d'état depended on the impotent Shah's dismissing the popular and powerful Prime Minister and replacing him with Gen. Fazlollah Zahedi, with help from Col. Abbas Farzanegan—a man agreed by the British and Americans after determining his anti-Soviet politics. The BBC spearheaded Britain's propaganda campaign, broadcasting the go-code launching the coup d'état against Iran's elected government. At the start, the coup d'état briefly faltered—and the Shah fled from Iran, however, after a short Italian exile, the CIA successfully returned him to Iran. Gen. Zahedi replaced the deposed Prime Minister Mosaddeq, who was arrested, given a show trial, and condemned to death. Showing "generosity of spirit," the Shah commuted Mossadegh's death sentence to three-years' solitary confinement in a military prison, followed by perpetual house arrest. In 2000, The New York Times newspaper partially published a censored version of the CIA document Clandestine Service History—Overthrow of Premier Mosaddeq of Iran—November 1952–August 1953 describing the planning and execution of the Anglo-American coup d'état. The newspaper published this as a scanned image, not as machine-readable text. An immediate consequence of the coup d'état was the political repression of National Front opposition and especially of the (Communist) Tudeh party, and concentration of political power in the Shah and his courtiers. Halliday says that the Shah exercised complete political control, using his secret service (SAVAK) and the military to crush anyone critical of the regime. Another effect, however, was sharp improvement of Iran's economy; the British-led oil embargo against Iran ended, and oil revenue increased significantly beyond the pre-nationalization level. Despite Iran not controlling its national oil, the Shah agreed to replacing the Anglo-Iranian Oil Company with a consortium—British Petroleum and eight European and American oil companies; in result, oil revenues increased from $34 million in 1954-1955 to $181 million in 1956-1957, and continued increasing, and the United States sent development aid and advisers. The CIA maintained a presence in Iran, where Soviets agents were also located. Iran also received economic aid from the Soviets, amounting to $280 million. According to a former Soviet agent, the Shah survived at least one KGB assassination attempt when an explosive device failed to detonate. In the second half of the twentieth century, the U.S. played the role that Britain had earlier in "running" Iran. In 1959, Iran and the U.S. signed a defense treaty. Throughout the 1960s and 70s, "Iran's growth as a regional power" went "hand in hand with the growth of its cooperation with the U.S." As the only state in the regional (until 1980) sympathetic towards Israel, the U.S. saw Iran as potentially a strategic ally should another conflict erupt. Halliday says that "virtually every general officer in the Shah's army has visited Israel and hundreds of junior officers" trained there. Moreover, the sight of the Shah of Iran fleeing the country until foreigners re-enthroned him was the major cause of his deposition in the 1979 Iranian Revolution. These actions by the religious revolutionaries severed American-Iranian relations. Remembering the embassy's command-center role in the 1953 coup d'état led them to its preventive occupation in 1979. Jacob G. Hornberger, founder and president of The Future of Freedom Foundation, said, "U.S. officials, not surprisingly, considered the operation one of their greatest foreign policy successes—until, that is, the enormous convulsion that rocked Iranian society with the violent ouster of the Shah and the installation of a virulently anti-American Islamic regime in 1979." According to him, "the coup, in essence, paved the way for the rise to power of the Ayatollah Ruhollah Khomeini and all the rest that's happened right up to 9/11 and beyond." This view can be justified on the basis that the Shah's pro-Western policies alienated both the people of Iran and its Muslim leaders so much so that revolution became inevitable. Various legislative measures removed the Muslim scholars from judicial posts and also transferred some of their income to the State. The 1953 coup d'état was the first time the U.S. had openly overthrown an elected, civil government. In the U.S., Operation Ajax was a success, with "immediate and far-reaching effect. Overnight, the CIA became a central part of the American foreign policy apparatus, and covert action came to be regarded as a cheap and effective way to shape the course of world events"—a coup against the elected Guatemalan government of Jacobo Arbenz Guzmán, which had nationalized farm land owned by the United Fruit Company, followed the next year. U.S.-British support for the dictatorial rule of the Shah and their role in overthrowing Mosaddeq's government has attracted censure as an example of duplicity. In 2000, Secretary of State Madeleine Albright, during President Bill Clinton's reign, called it a "setback for democratic government" in Iran. On the one hand, the U.S. and Great Britain speak about their commitment to spreading democracy and to opposing tyranny; on the other hand, they appear to compromise their principles when their own economic or strategic interests are threatened. With other example of these nations supporting non-democratic regimes, the legacy of the anti-Mosaddeq coup makes the task of spreading freedom around the world harder to achieve, since the real intent of intervention by the Western powers, when this occurs, can be questioned. The Shah himself asked where his friends were in 1979 and why the CIA had appointed a new head of station who knew nothing about Iran, or the crises it was experiencing. Constant interference by foreign powers in the internal affairs of Iran over more than a century alienated the people of Iran from the Western world. The close ties that did exist between Britain and the U.S. and Iran ought to have helped to spread better cross-cultural understanding. However, the foreign powers acted in their own interests, playing their proxy imperial, then Cold War games in Iran with little or no real concern for the welfare of the Iranian people. The Shah was perceived to pay Islam mere lip-service as he curbed the influence of the religious leaders. Shi'a Islam invests the religious leaders with special authority, which has found expression in the post-1979 Constitution of Iran, where the supreme leader is a senior Muslim jurist. ↑ 1.0 1.1 Mike Thomson, A Very British Coup BBC, August 22, 2005. Retrieved February 6, 2018. ↑ Stephen Kinzer, All the Shah's Men: An American Coup and the Roots of Middle East Terror (Hoboken, NJ: J. Wiley & Sons, 2003, ISBN 978-0471265177), 48. ↑ Mohammad Reza Pahlavi, Answer to History (New York, NY: Stein and Day, 1980, ISBN 978-0812827552), 70. ↑ Nikki R. Keddie and Yann Richard, Modern Iran: Roots and Results of Revolution (New Haven, CT: Yale University Press, 2006, ISBN 978-0300121056), 101. ↑ Sandra Mackey, The Iranians: Persia, Islam, and the Soul of a Nation (New York, NY: Dutton, 1996, ISBN 978-0525940050), 178. ↑ Pahlavi (1980), 84 and 88. ↑ 7.0 7.1 Kinzer (2003), 106. ↑ Ervand Abrahamian, Iran Between Two Revolutions (Princeton, NJ: Princeton University Press, 1982, ISBN 978-0691053424), 268. ↑ 10.0 10.1 10.2 10.3 Dan de Luce, The spectre of Operation Ajax The Guardian, August 20, 2003. Retrieved February 6, 2018. ↑ Seyyed Vali Reza Nasr, The Shia Revival: How Conflicts Within Islam Will Shape the Future (New York, NY: Norton, 2006, ISBN 978-0393062113), 124. ↑ Jonathan Schanzer, Review of All the Shah's Men by Stephen Kinzer, Middle East Quarterly, Summer 2004. Retrieved February 6, 2018. ↑ Keddie and Richard (2006), 140. ↑ 15.0 15.1 Kinzer (2003), 84. ↑ 16.0 16.1 Pahlavi (1980), 91. ↑ Fred Halliday, Iran, Dictatorship and Development (Harmondsworth, UK: Penguin, 1978, ISBN 978-0140220100), 36. ↑ Donald Wilber, Overthrow of Premier Mossadeq Of Iran, November 1952- August 1953 CS Historical Paper No. 208. Retrieved February 6, 2018. ↑ Vladimir Kuzichkin, Inside the KGB: My Life in Soviet Espionage (New York, NY: Ballantine Books, 1990, ISBN 9780233986166). ↑ 31.0 31.1 Halliday (1978), 252. ↑ 33.0 33.1 Ralph R. Reiland, Washington's wise advice Pittsburgh Tribune Review, July 30, 2007. Retrieved February 6, 2018..
↑ U.S. Comes Clean About The Coup In Iran CNN, April 19, 2000. Retrieved February 6, 2018. Abrahamian, Ervand. Iran Between Two Revolutions. Princeton Studies on the Near East. Princeton, NJ: Princeton University Press, 1982. ISBN 978-0691053424. Halliday, Fred. Iran, Dictatorship and Development. Harmondsworth, UK: Penguin, 1978. ISBN 978-0140220100. Kapuściński, Ryszard. Shah of Shahs. San Diego, CA: Harcourt Brace, Jovanovich, 1985. ISBN 978-0151814831. Keddie, Nikki R. and Yann Richard. Modern Iran: Roots and Results of Revolution. New Haven, CT: Yale University Press, 2006. ISBN 978-0300121056. Kinzer, Stephen. All the Shah's Men: An American Coup and the Roots of Middle East Terror. Hoboken, NJ: J. Wiley & Sons, 2003. ISBN 978-0471265177. Mackey, Sandra. The Iranians: Persia, Islam, and the Soul of a Nation. New York, NY: Dutton, 1996. ISBN 978-0525940050. Nasr, Seyyed Vali Reza. The Shia Revival: How Conflicts Within Islam Will Shape the Future. New York, NY: Norton, 2006. ISBN 978-0393062113. Pahlavi, Mohammad Reza. Answer to History. New York, NY: Stein and Day, 1980. ISBN 978-0812827552. Roosevelt, Kermit. Countercoup, the Struggle for the Control of Iran. New York, NY: McGraw-Hill, 1979. ISBN 978-0070535909. The C.I.A. in Iran—New York Times report based on uncovered CIA documents. The Secret CIA History of the Iran Coup, 1953—Provided by the National Security Archive. US-Iranian Relations, the 1953 CIA Coup in Iran and the Roots of Middle East Terror—Interview with Stephen Kinzer, author of All the Shah’s Men. Review of All the Shah's Men by David S. Robarge. The spectre of Operation Ajax by Guardian Unlimited. History of "1953 Iranian coup d'état"